Lot of 20 assorted Anaheim Angels 8 1/2 by 11 inch 1997 Halo Heroes photo cards of former greats and 1998 Then and Now artwork cards of current players printed on heavy paper stock: Bob Boone (2), Don Baylor, Rod Carew, Doug DeCinces, Gary DiSarcina, Brian Downing (3), Jim Edmonds (3), Darin Erstad, Ken Forsch, Todd Greene, Bobby Grich, Fred Lynn, Mike Witt and Geoff Zahn (2). 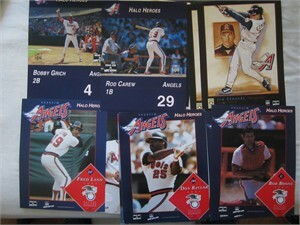 Cards have minor handling flaws and wear mostly on corners and edges, no major creases or writing. ONLY ONE LOT AVAILABLE FOR SALE.